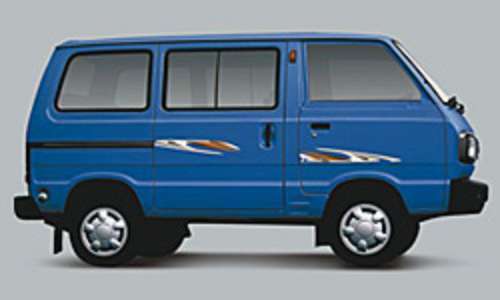 The Maruti Omni is a minivan manufactured by Indian auto major Maruti Suzuki. The first version of Maruti Omni had 796 cc engine, same as the Maruti 800 city car. This was the second vehicle to be launched by Maruti, one year after the 800, in 1984. The Omni could be divided into two categories: the family version and the cargo version. The newer family version has two extra seats directly behind the front seating and facing away towards the rear of the van making it an eight seater. Older versions were modified by individual owners to add additional capacity this way. The cargo version does not consist of back seats. Both versions have sliding back doors and hatchbacks. The Omni is also unique in a way that it uses a front mid engine rear wheel drive layout, as it helps in maximizing cabin and cargo space and providing maximum traction. * Omni XL - 1999, same engine, modified with a higher roof. * Omni Cargo LPG - 2004, created to answer the growing popularity of this car being used as an inter-city cargo vehicle. * Omni LPG - 2003, same 796 cc engine, added with a factory fitted LPG Kit. This makes it the most economic 4 wheeler in India, as far as the driving costs are concerned. * Omni Ambulance - A Modified E version into an ambulance vehicle. This is the most common type of ambulances found in Indian cities.